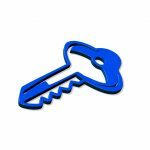 Do You Have The Keys to Your Website? Whether you make your own website updates or not, you still need the keys to your website. Do you have the FTP Login? Blog Login and Hosting Login details? I’m not saying that you have to make your own website updates, you just need to have the keys to your site. Shoot, I don’t cut my own hair or do my own auto repairs – I go to professionals for that! The keys are KEY in case something goes wrong. For example, we got a 911 call from a client – his site was down. We built the site but a small, independent web firm was hosting it (which we did not recommend, but the client wanted to support the business owner, a friend of his). When the site went down, his friend was MIA for over 24 hours. Because we had the access to his domain registrar and the keys to his site, we were able to get him to professional GoDaddy hosting in a matter of an hour. It’s a healthy exercise to make sure you have in your files updated FTP, blog and hosting logins. If you don’t have access to your site, blog or social media and your web marketing people won’t give it to you, that’s a problem…..
We can talk you off the ledge if that’s the case….